No matter under what kind of weather, I love to have curry. If the weather is cold, curry helps warm up my body. If the weather is hot, curry can increase my appetite. This dish is so easy to make. A store-bought curry paste can help a lot. For making the sauce, simply stir in some coconut milk, then season with some fish sauce. 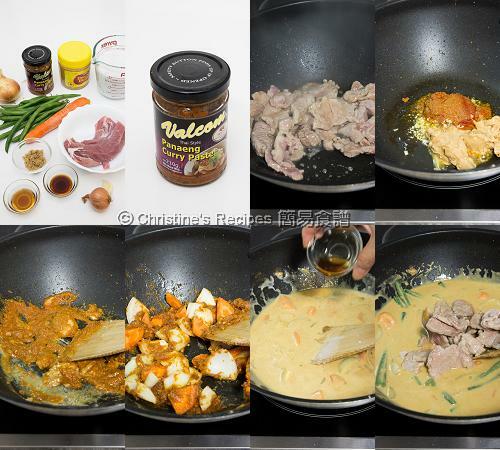 In this sauce base, you can add any vegetables of your favourite and pork fillet. 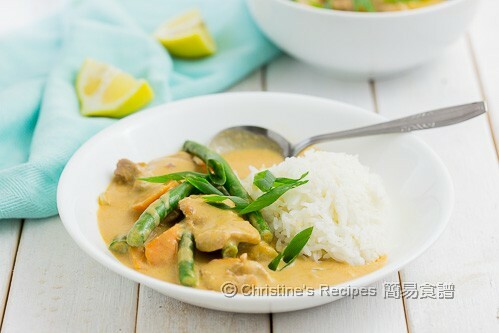 Then this delicious one-pan curry dish is finished. Sounds easy enough? It’s quite balanced. 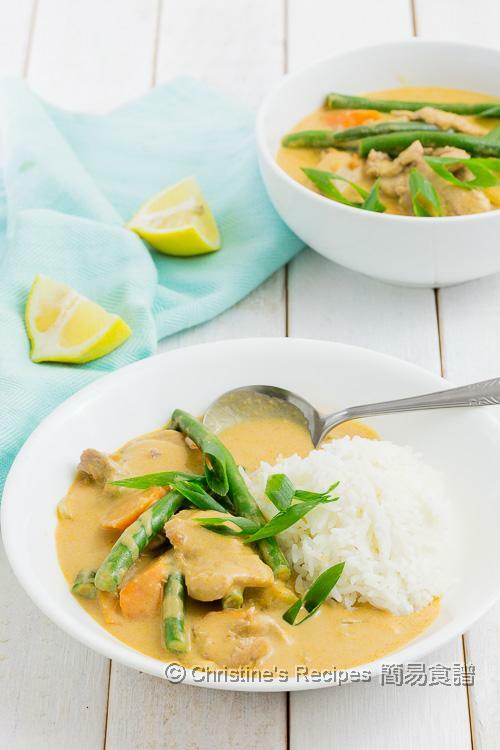 You’ll have veggies and protein to go with steamed rice. Cut the pork fillet into slices. Mix with the marinade and set aside for 20 minutes. Blanch the green beans for 2 minutes. Drain out and rinse with tap water. Set aside. Heat oil in a frying pan over medium high heat. Add the pork, then quickly spread it out into one layer. Cook until both sides change colour. No need to cook it through at this step. Set aside. In the same pan, heat more oil. Saute shallot and garlic. Add the red curry paste and peanut butter. Saute until aromatic. Add the onion and carrot. Stir to combine. Pour in the water and cook until the onion is softened. Add coconut milk, brown sugar, fish sauce and soy sauce. Toss back the pork fillet. Add the green beans. Cook until the pork is done. Serve on steamed rice immediately. Red curry paste is available at Asian grocers. I used the smooth type of peanut butter. The other type with coarse peanuts inside will work for this recipe as well. By blanching green beans, then rinse in cold water, their green colour can be retained. Pork fillet is quite lean and tender. It’s perfect to be used in this dish. It looks so appetizing! Now I really crave some curry.